On this blog, we will meet International Livestock Research Institute (ILRI) staff members, partners and projects in Asia to learn about their work, challenges and the opportunities they face to leverage livestock knowledge in Asia. Located now in Dehradun, Sapna Jarial isn’t too far from her hometown of Dharamshala, located in India’s northern mountainous region. Since joining ILRI in 2009, Sapna’s time has been largely spent providing project support to the Tata-ILRI partnership project – Enhancing Livelihoods through Livestock Knowledge Systems (ELKS) – where she is able to make use of her proximity to the project action sites in providing on-the-ground coordination for the project. Sapna, what does your role with ELKS specifically see you doing on a day-to-day basis? Presently I am working as a Special Project Scientist for ELKS, a role that involves providing support to achieving the overall ELKS objectives for Tata (project partner) and ILRI in Uttarakhand. This includes providing general support, and backstopping the implementation by our expert teams as they formulate breed development programmes designed specifically for the hilly and tribal regions in which we work. My role also sees me coordinating ‘action research’ through implementing field level activities in the promotion of dual-purpose crops, more sustainable and cost-effective feed technologies, and value-chain analysis for goats. Besides this coordination, my position also calls upon me to organize meetings, conduct stakeholder consultation workshops, and prepare extension materials. One of my favorite things about my position is the opportunity it provides to travel to our more remote field sites to meet with the inspiring people with whom we work – the curious and committed governmental and non-governmental partners, the hardworking women and the innovative men, and helping them recognize that together, enormous improvements in the region’s livestock sector can be achieved. What do you see as the defining characteristics of the livestock sector in the northern hill areas of India? The challenges we face here in northern India, whilst not exclusive to the region, are definitely long-standing challenges that were around long before my arrival. I’m referring to specifically – feed scarcity, service exclusion and isolation in breeding, poor health-care management, and inefficient production amongst others. 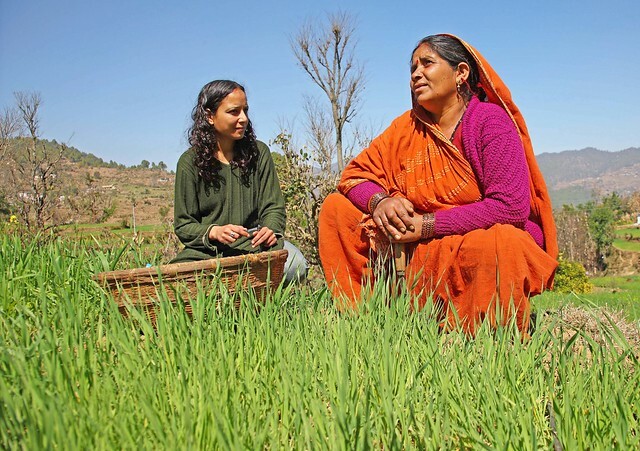 Here in Uttrakhand where infrastructure isn’t yet as developed as other areas of the country, farm women in the mid-hills often walk 3 to 4 hours to reach forests and suitable trees, which are then climbed in order to fetch fodder leaves. They also spend their days cutting grass in order to attain sufficient feed for theirs cows and buffaloes, which still only yield on average, approximately 250 grams to 3 litres of milk per day. This social and traditional practice takes place regardless of sun or rain, only allowing for respite once the winter consumes the region, bringing with it steep drops in both temperature and available vegetation. Though small cows and buffaloes dominate livestock herds here, the region also has many crossbreeds – ‘improved’ exotic breeds with greater production capacities. In addition, the state also does not identify with one designated breed of cow and buffalo, like those found in the plains of India (cattle-breed Ongole of Andhra Pradesh, or Hariana of Haryana). 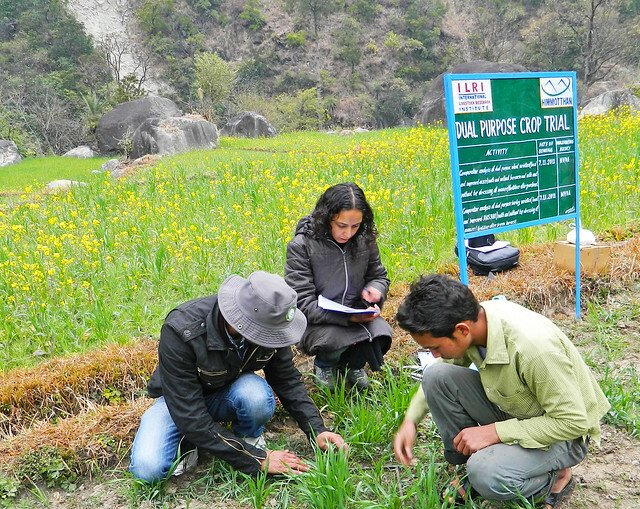 Uttarakhand also has a somewhat unique approach to organic agriculture, setting it apart somewhat from other regions of India. For instance, within the state, livestock-keepers are known to sell their indigenous cow’s distilled urine for medicinal purposes, benefiting from a higher market price than that commanded by milk. Though not a widespread practice, pockets of the state still adopt these market practices. What are the key challenges and opportunities you believe the livestock sector in the region faces? I think the first problem we face here relates to overcoming our resource-limitations, possibly through changing the mind-set of farmers and doing more farm-related research – perhaps through exploring more effective adoption of research-based demonstrations. In my opinion, at times farmers and researchers like to focus upon their favorite research ideas, something that could be better supported through greater testing and demonstrations in order to bring about a faster change e.g. dual-purpose crops. Another major challenge we face relates to motivations and incentives, and specifically how we can better encourage our farmers to adopt more effective and efficient farming practices. Simply telling them this or that practice is more effective isn’t enough. That is where I believe research-based demonstrations would again be incredibly useful. Lastly, I’d like to identify the strengthening of the ability of the state government to cater for the livestock sector as another key challenge. Finding solutions to positively affect the ‘un-reached’ farmers, instead of duplicating efforts by creating alternate parallel structures will be of great use. In your experience, are there any major trade-offs to working in a regional office as opposed to being based in a major city, such as in ILRI’s Delhi office? So yes, I have worked in Delhi and Pune (India), but at that time I was not with ILRI. Metro city life definitely has a faster pace to it, bringing with it a distinct mix of pros and cons, for instance – much greater air pollution, air-conditioned metros, wider roads, towering malls, larger crowds and more social events. Now with our regional cities being able to provide a similar level of amenities to their city counterparts, regional offices bring about their set of advantages, for instance good rail, road, and air connectivity in-and-out of the city, not to mention cleaner air, and a slower, more relaxed pace with less of the hustle-and-bustle you’ll find in the larger cities. Not to mention that now with such easy access to the internet, the world has become a much smaller place in a lot of ways. Tags: ELKS. Bookmark the permalink.